Have fun creating your own poms poms with these easy-to-use tools. Experiment with different colors—even try variegated yarn for multi-colored pom poms. Use your left over yarn to make pom poms to add to lampshades, pillows, or fringe on a blanket. Finished sizes: 1 3/8" and 1 5/8"
Clover Pom Pom Maker, Small is rated 4.7 out of 5 by 23. Rated 4 out of 5 by iMartie from Cute, perfect Pom poms! Throw the cardboard away. This makes pom poms easy peasy. My only suggestion is to dump the enclosed instructions and look up instructions on YouTube. It’s worth not ever having to use cardboard again. Cute pom poms every time! Rated 4 out of 5 by Jennrg from Easy to use Been able to increase number of pompoms made in less time. Rated 5 out of 5 by Catef from Clover pompom maker Definitely was not as expensive as I thought it would be. Works great. 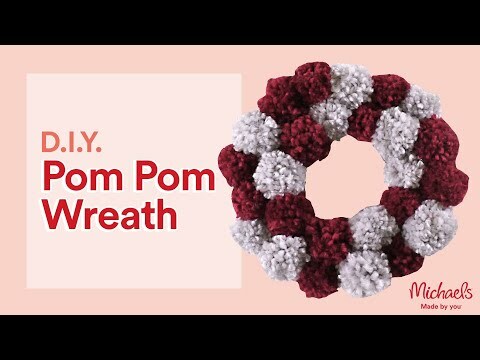 Rated 5 out of 5 by Cindy2001 from Great Pom Pom maker These Pom Pom makers are great. As others have said they are easy to use, but what I like is you waste less yarn than making them on a cardboard form or wrapping around your hand. There is much less trimming to get them to look good.